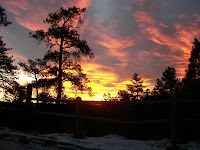 On my way to the gym this morning I stopped to take some pictures in Palmer Park. The sun was almost ready to break through the trees and the sky was a fireball! I should have waited just a few more minutes because as I looked to the west after leaving the park, the colors had transferred to the Peak - the shot that got away. I will be on the bluffs tomorrow morning at 6:30 a.m.